Scientists Warn That Hawaii's Kilauea Volcano Could Erupt 'Ballistic Rocks' : The Two-Way The U.S. Geological Survey says that as magma in the volcano drops below the water table, it could create steam pressure and a sudden eruption that would spew toxic gas and "ballistic rocks." Severe ground cracks associated with what's known as Fissure 14 are seen in a burned-out landscape in Leilani Estates near the town of Pahoa, Hawaii, on Wednesday. Geologists are warning that Hawaii's Kilauea volcano — which has been belching toxic gas and oozing lava into a residential area for the past week — could erupt explosively in the coming weeks. 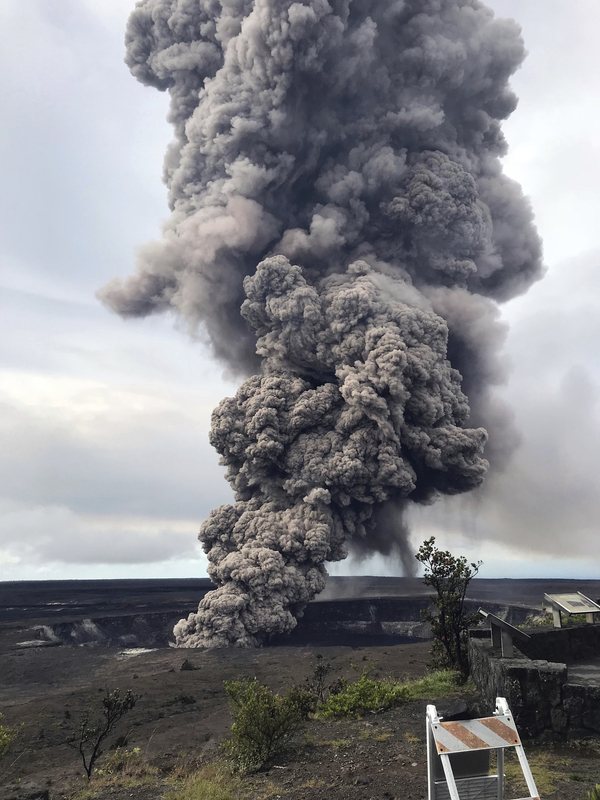 The possibility of such a sudden eruption will increase as lava flows from Kilauea's summit crater down its face and magma falls below the water table, the U.S. Geological Survey said. That could create steam pressure that would then explode. The volcano could then eject "ballistic rocks" of lava up to several feet in diameter, the USGS said. 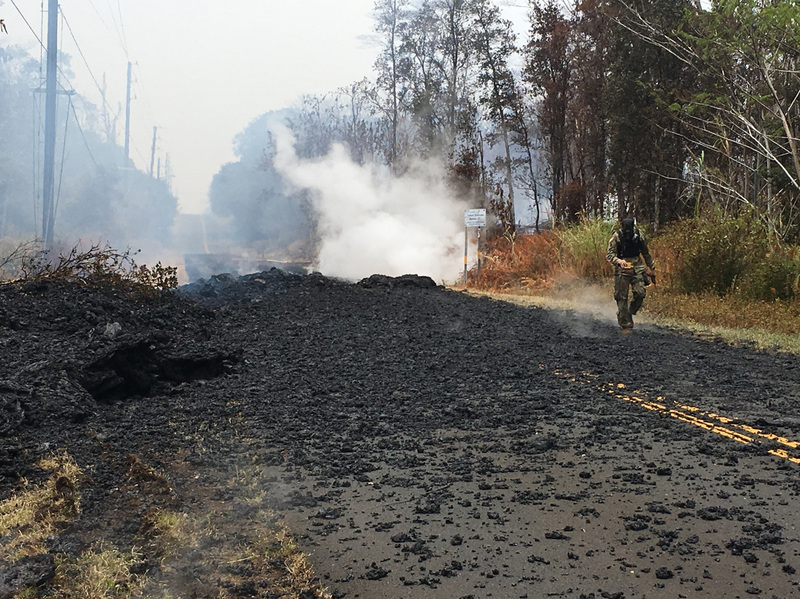 Kilauea, one of the world's most active volcanoes, began spewing lava into the Leilani Estates residential area a week ago after its increased activity was foreshadowed by dozens of small earthquakes. An ash column rises from the overlook at Halema'uma'u Crater at the summit of Kilauea volcano in Hawaii Volcanoes National Park on Wednesday morning. The warning comes as volcanologists in Hawaii report a new fissure at the entrance to another residential area on the Big Island, where thousands have already been forced to evacuate. The Hawaiian Volcano Observatory confirmed Wednesday that a new fissure appeared in Lanipuna Gardens, making a total of 15 such surface cracks where molten lava and gas are escaping, according to Hawaii Public Radio. 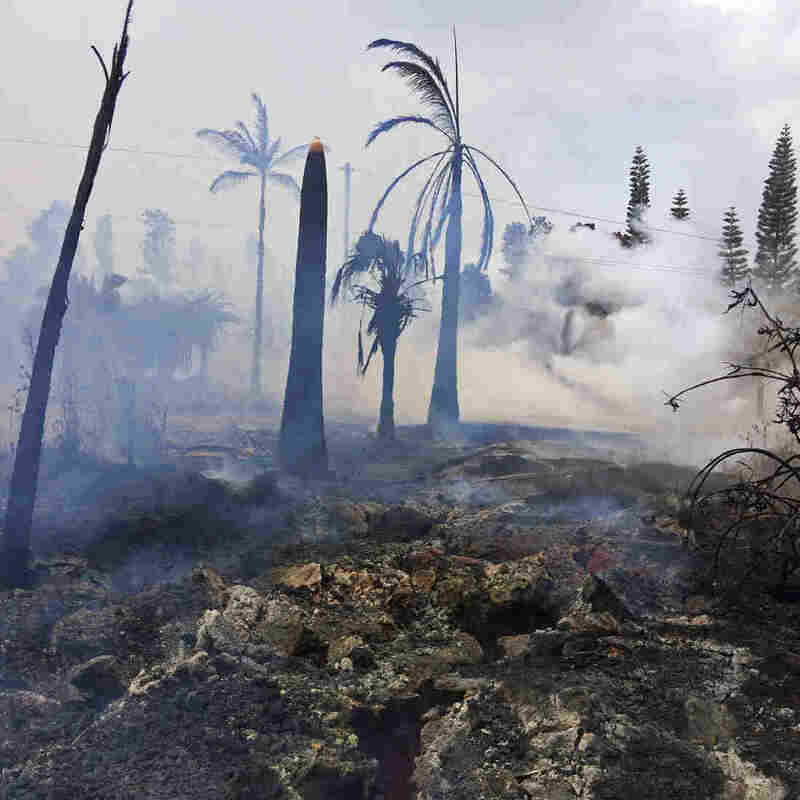 Lanipuna Gardens, near the town of Pahoa along the island's east coast, is adjacent to Leilani Estates, which has been engulfed in lava. HPR says no one is being allowed access to Lanipuna Gardens but residents of neighboring Leilani Estates were permitted to go in long enough to retrieve their property. So far, 36 structures have been destroyed by the lava flow. Don Swanson, a geologist with the Hawaiian Volcano Observatory, told reporters that the magma is likely to drop below the water table around the middle of the month. "We suspect it's a rapid process. We really don't know for certain," he told reporters on a conference call. Sgt. Milo Kalama of the Hawaii National Guard checks sulfur dioxide levels at the 13th fissure that has opened up in Leilani Estates. "Hawaii Gov. David Ige said a geothermal energy plant near the lava outbreak was accelerating its removal of stored flammable gas. The Puna Geothermal Venture plant has about 50,000 gallons of pentane on site but he expected this would all be removed by the end of the day Thursday. It would be 'very, very hazardous' if a volcanic vent were to open under the facility where the fuel is stored, the governor said."